An ex-police sergeant has found himself on the other side of the law after he was arrested along with other members of his gang. 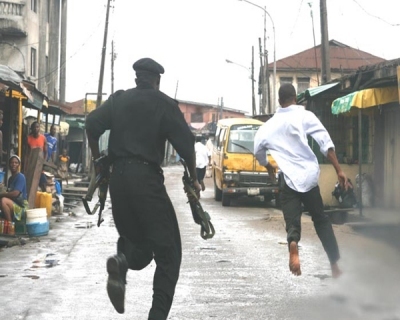 Eboma Onyeka, allegedly involved in an earlier robbery and murder but jumped bail was nabbed with three others, Ezekiel Omoloye, Sunday Gabriel and Shola Atoki, after a robbery operation at a new generation bank at Akowonjo in the outskirts of Lagos, Southwest Nigeria. During the operation, they allegedly killed the bank’s security guard, Sunday Ogundipe and stole an unspecified amount of money from the bank’s Automated Teller Machine, ATM. They were arrested and arraigned before an Ikeja Magistrate’s Court on a three-count charge of conspiracy, robbery and murder. Their counsel, J.T. Japuna filed an application for bail at a Lagos High Court sitting at Igbosere. And they were granted bail. But they all jumped bail. Luck ran out on the suspects when the Director of Public Prosecution, DPP’s report was released and the DPP advised that the first three accused persons had case to answer. The DPP’s advice absolved Shola Atoki on the ground that the first three suspects mentioned one Shola, a staff of the bank as their accomplice. But none of them could confirm the surname of the said Shola. The colleague of the slain security guard, Gambo Freeman, who was alleged to be part of the conspiracy, was absent from duty on the day of the robbery. He was also recommended to face trial. Sources at the Special Anti-Robbery Squad, SARS, told P.M.NEWS that Onyeka and others were granted bail under questionable circumstances and they had to be rearrested. A manhunt was launched for Onyeka and other suspects. One of them was rearrested in a hotel in Ikotun, Lagos. When interrogated, he allegedly confessed to SARS operatives that Onyeka was the leader of robbers who burgled banks’ ATMs. Onyeka and others were subsequently rearrested. In an interview Onyeka, a native of Agbor, Delta State, Southsouth Nigeria, confirmed that he served in Mopol 20, Ikeja and he was dismissed after 15 years in service. The officer in charge of SARS, SP Abba Kyari confirmed that the suspects will be charged to court soon.